Terry Lovelace, Esq. 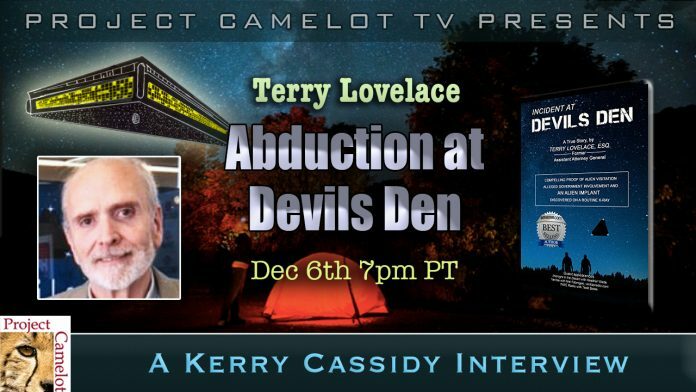 has written an excellent book called INCIDENT AT DEVILS DEN about his and a close friend’s abduction will be my guest tonight 7pm PT. ..”This is my true story. Written by Terry Lovelace, a 64 year-old lawyer and former assistant attorney general. In 2012 a routine x-ray of my leg found an anomalous bit of metal the size of a fingernail with two tiny wires attached. What followed were horrific nightmares, spontaneous recall and intrusive thoughts surrounding a 1977 camping trip I took with a friend to Devils Den State Park in Northern Arkansas. For fear of losing my job and my standing in the legal community I’ve kept this secret for 40 years. But the 2012 discovery of this object, one and one-half inches deep in my thigh, initiated a flood of nightmares I could not control. My poor health and the horrific memories were the catalyst to come forward and finally disclose what happened back in 1977. My friend and I were on a two-day camping trip to photograph eagles and wildlife. Rather than stay in the campground we chose to drive deep into an isolated area and set-up our camp on a high plateau that offered a scenic view of the wilderness. Late in the evening of our first night in camp a group of three very bright stars in the western sky caught our attention. Arranged in a triangle configuration we speculated as to what it could be? We eliminated aircraft lights due to the triangle configuration. Then it moved. The three stars rotated as if on an axis and slowly ascended upward. As it rose the three points of light spread apart, each equidistant to the others. The stars grew larger and brighter. As the triangle passed over stars they would blink-out for a moment and then blink-back again as it moved over them. The area inside the triangle was black, darker than the night sky. As the points expanded they were eventually devouring entire fields of stars as it traveled higher and moved closer to our camp. It eventually halted directly over us. It was huge. A third of the sky was covered by this black triangle overhead without a single star in between the three points. It was as if someone had cut an enormous triangle out of a sky filled with a billion stars. It descended until it was about thirty feet over the floor of the meadow. The size of the object was unbelievable. Each side of the triangle was a city block in length. I estimated its height at fifty feet or more. The size of a five story office building it sat motionless above the floor of the meadow. What followed was a horrific abduction experience. We both suffered badly from burns and dehydration and were hospitalized for two nights. I was interviewed by special agents from the USAF Security Police’s “OSI” or Office of Special Investigations. They mistakenly believed I had photographed the object and I was viciously interrogated by two of their special agents. They demanded my film. My home and car were searched by consent and I was hypnotized to assist my recall. 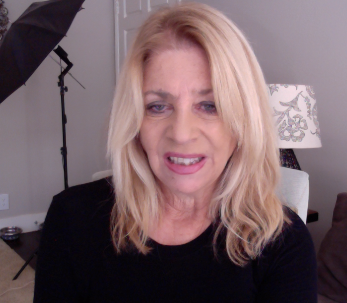 It was a nightmare that left my wife and I sour on the whole UFO and the allegations surrounding our experience. I never intended to tell anyone. But the events of 2012 opened a door to memories about the abduction experience I had long forgotten and had no desire to even remember. In 2016 and in poor health I decided it was the right time to disclose everything I knew and everything we experienced. The piece of metal in my leg was the genesis of this story. There is so much more that happened.”–Terry Lovelace, Esq.